The ultimate Southern California lifestyle awaits at this modern masterpiece on the sand, where stunning design, high-end features and dramatic white-water views are found throughout the estate with an alluring split-level courtyard, pool, and spa at its core. Reflecting the talents of architect Mark Singer, the contemporary oceanfront residence carefully blends crisp angles and sleek fixtures with natural Lompac stone walls, Spanish limestone and Pacific Ocean views at nearly every turn. 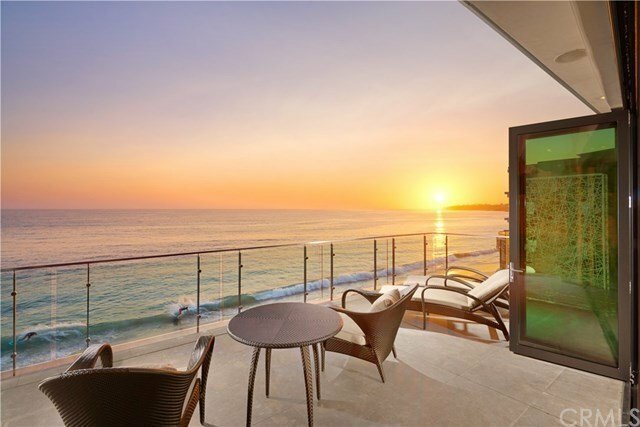 Glide-away accordion doors open the main living area to a surfside deck with direct beach access and panoramic ocean, shoreline and sunset views. Soothing ocean breezes refresh the senses in a great room and kitchen area complete with a fireplace, large island with bar, custom Poggenpohl cabinetry and top-end appliances. Appx. 4,378 s.f., the 3-br, 4.5-ba design is served by an elevator and showcases a floating staircase, custom lighting, floor-to-ceiling windows, solar energy, and a state-of-the-art Savant smart-home automation system including iPad/phone interface. The resort-worthy master suite is appointed with a view deck, fireplace and bath with stand-alone tub, all of which enjoy a backdrop of sparkling seas. A media room with wide screen and surround sound, an office, 3-car garage, and 3 driveway spaces are additional highlights. Relax at home while surfers challenge the waves, or hit the town, where restaurants, galleries and shops are just outside your doorstep in Laguna's Village.